The Peel Canal is a crucial point in the water system because the water levels here react quickly to weather conditions. 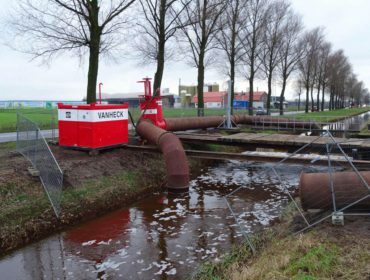 A number of weirs In the Peel Canal were built in 1939 and must be capable of handling larger capacities of water in the future, making renovation and automation of the weirs essential. A number of these weirs will also be made passable for fish. 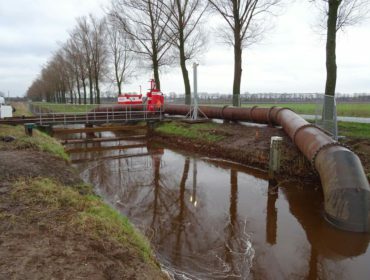 Contractor Vissers Ploegmakers has been commissioned to renovate and automate eleven weirs for the Water Board AA and Maas. During the renewal of the weirs, the water must be temporarily diverted. Van Heck is involved in this. Using two Van Heck siphon systems, equipped with a water level alarm, the continuity of the work is ensured. When the renovation of one weir is almost completed, Van Heck’s mechanics work together with the client to ensure that a siphon installation is built up at the next weir so that work can proceed directly. The renovation works are expected to be completed by the end of April 2018 and the weirs in the Peel Canal will be ready for the future!